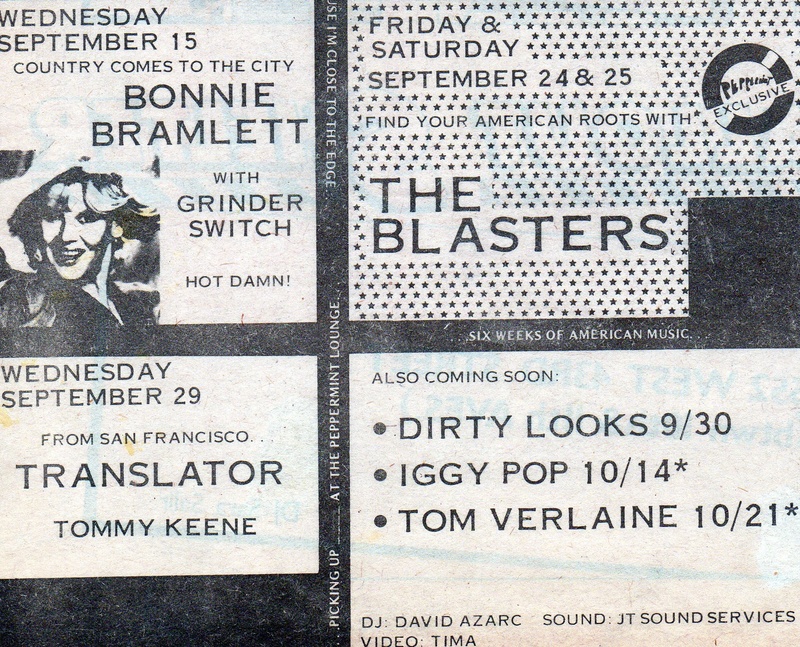 The October 1982 lineup looks pretty good at rock/new wave venue the Peppermint Lounge, which had just moved downtown to 100 Fifth Avenue earlier that year. First up is Iggy, then Tom Verlaine performs a week later. This ad comes from the September 1982 issue of neighborhood arts and entertainment newspaper the East Village Eye. This entry was posted on May 8, 2010 at 4:06 am and is filed under East Village, Flatiron District, Music, art, theater, Old print ads, Uncategorized. You can follow any responses to this entry through the RSS 2.0 feed. You can leave a response, or trackback from your own site. After this, Iggy took a downward addiction spiral. I saw a documentary about him, and he was actually homeless and living in a squat in Miami for a few years. I wonder if he was living in the newly condo-ized Christodora House on Avenue B at that time. Ahhh the old peppermint. Saw many many a punk show there. Wildnewyork, I don’t think Christodora House was renovated until around 1986 or 1987, so I doubt Iggy would have been living there yet. The Blasters! Not too shabby themselves. That was my thoughts looking at those posters! The Blasers at their peak! A 2 nite run! Hi all, I’m trying to find out if there is a bar or pub where the Peppermint Lounge used to be? I’m trying to organize a trail of tribute shows as homage for The Go-Betweens lead singer Grant McLennan. They played at the Peppermint Lounge in 198, but from what i can find out, it no longer exists. Can anyone help? The Peppermint Lounge at 100 Fifth Ave is now a Bebe store. No bar or pub. In 1985 Ed Koch was mayor.